With many requests, here it is, the pie recipe! I took a course a few months ago (a gift for my birthday) and I learned how to make this pastry as well as pâte brisée. This recipe is tested and tried so I have faith that it will work out for you! It’s an adaptation of a classic recipe from Cook’s Illustrated. The unique thing about this dough is the addition of vodka. I was told that it helps prevent the gluten from developing as much, so the dough becomes more pliable and forgiving, that being said, there isn’t too much vodka in it. 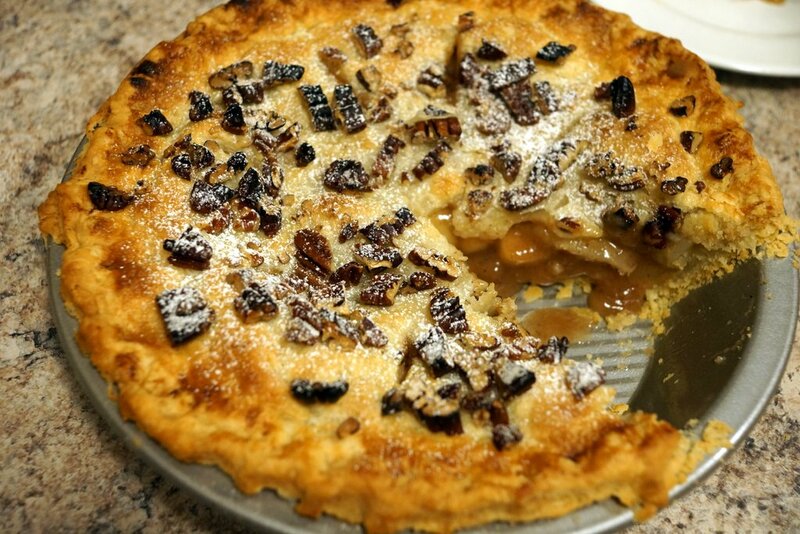 I’ve used this dough for peach pie, blueberry pie, apple pies and now this apple/pear combo. Save the egg white, for brushing the inside of the bottom layer before putting the fruit! 1) Peel your apples and pears and cut them into equal size slices, maybe 1/4″ thick half moons. 2) Toss the apples and pears in the lemon juice to prevent browning. Disperse the sugar evenly over the top of the slices with the cinnamon. After mixed, put the fruit in a colander over another bowl to let the juices drain. 3) After around 10 minutes of letting the juices drain from the apples, use this juice to mix your flour until thoroughly combined into a thick sauce-like consistency. 4) Put a pot on the stove on medium heat and add the butter. Once melted, add the fruit and stir quickly. Add the juice and flour mixture and stir until it coats all the fruit. Take off the stove. 5) Get your flour and salt together in a bowl and mix. 6) Add half your flour and around a 1/3 the amount of your cold butter. 7) Pulse in your food processor until you achieve an almond meal-like texture. 8) Add the rest of your flour mixture, cold butter and cold shortening. 9) Pulse until your dough creates pea-sized clumps. 10) Add your ice cold water and vodka to the dough in a bowl and combine with a wooden spoon. 12) Flatten each piece roughly and wrap in plastic wrap. Put in the fridge for 30 minutes or in the freezer for 10 minutes. Roll out the dough to fit your pie tin. I use a 9 inch tin. 13) Using the egg white only, brush the inside of the pie. This will help prevent the crust from getting too soggy from the filling. 14) Fill the pie just to the brim. I personally don’t like my pies to be overflowing too much. Preheat your oven to 425F. I use a pizza stone, so you need to preheat it gradually so make sure it is in there when you are preheating. 16) Cut some vents in the dough to allow the steam to escape. 17) You can do any design you like for the edges or cut-outs but this is how I pinched the crust for this particular pie. 18) Bake the pie in the middle rack on the pizza stone at 425F for 20 minutes. Then lower the temperature to 375F and bake for another 35 minutes or until you are happy with the colour of the crust. The pecans on this pie got a bit dark but they didn’t taste burnt. To cover up the darkness I added a bit of powdered sugar. Cool the pie for at least an hour. I made this pie for a contest winner and they told me they liked ginger, so I paired it with a ginger ice cream. The ginger ice cream is in the process of being edited right now so stay tuned for that recipe. 19) Eat it and enjoy! Next Banana Cream Mini-Pies with a Twist!